All That Gundam is a very short video flaunting some of the Mecha from the first ten years of Gundam. It is a nice little watch if you are a fan of the Gundam universe. 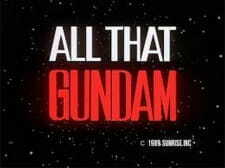 At one minute length there really ISN'T a reason not to watch this even if you hate the Gundamz. This short video is a teaser and advertising for Mobile Suit Gundam 0080 OVA released shortly after Char's Counterattack movie and at the same time celebrating the 10th year anniversary of the franchise and the new Gundam Alex and its characters. The launching of the Gundams and their attacks followed with Psycho Gundams was cool. The music piece played is also catchy. nothing to say more for an advertising, but any Gundam fan would surely like the "Gundam Team-Up" scene. This is nothing more than a commercial for the Gundam franchise. All That Gundam does serve as a good introduction to any given Gundam series. No plot here, just a cool music video. Seen via English Subtitles but the only way they were useful were in the credits. The story was hidden. All i could figure out from that trailer was robots and space. Those two can work but how are they working is the question? Also, what was the point in showing the credits before the trailer began? Unless you are a very popular director or writer i can see the point but even then everyone has their own flaws. Just because you are good doesn't mean you can't write or direct trash. I am guessing that wasn't the case here of popularity for none of the names were more outstanding in comparison to the rest. So, all they did was waste time boring their audience. interesting effects and music but what about the actors? who is playing who? Not sure about japan but with America some actors are terrible that it affects the movie regardless of how good it is.